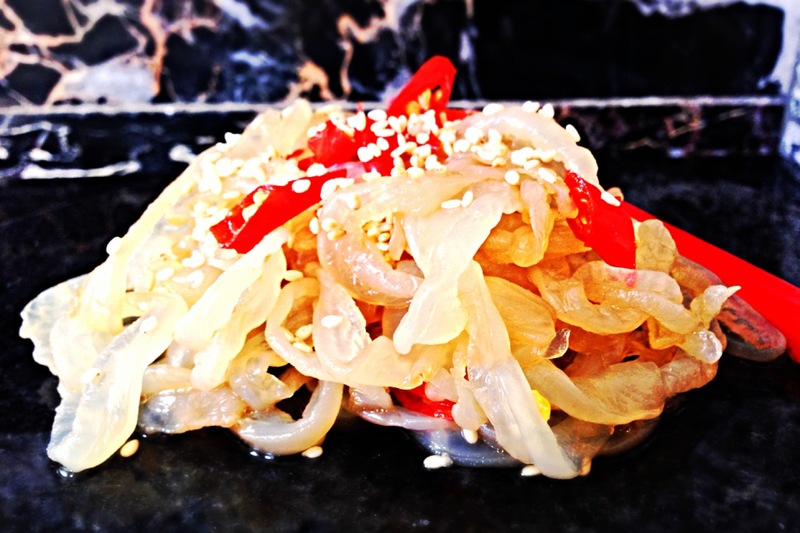 Jellyfish is one of the many adored texture foods for Chinese people. Often eaten at Chinese banquets and at special occasions. 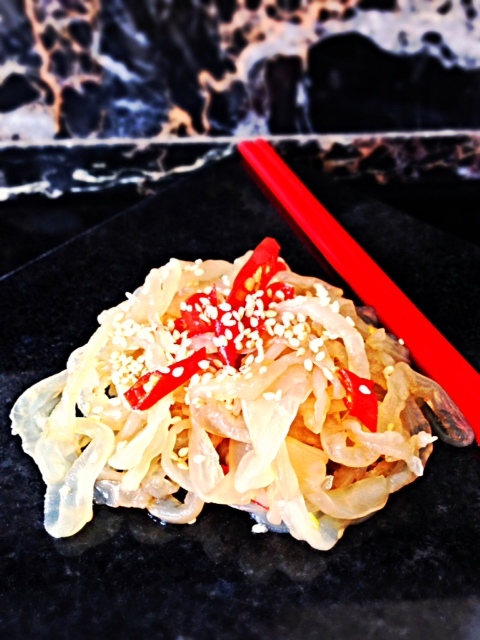 Jellyfish is served as one of the appetizers in a cold assortment at banquets, or presented as a salad with shredded vegetables such as cucumber, carrots, spring onions and sometimes chicken to bulk up the dish. 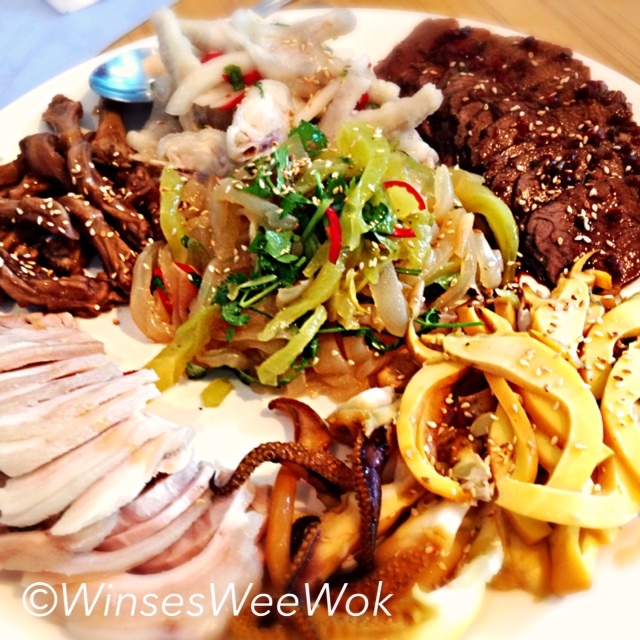 A cold platter/appetizer for a banquet with the jellyfish, mixed with pickled vegetables in the middle. Jellyfish is utterly tasteless but we love it for its crunchy texture and it absorbs any oils, dressings and flavours you add to it. If you’ve never heard of edible jellyfish or eaten it before, you probably would perhaps like to try it. Be adventurous with foods! You know you want to! For those like me who had it many times in Chinese restaurants you will love this! However not all jellyfish are edible and some are extremely poisonous but the ones on the shelves at Markets and Chinese supermarkets are the edible ones. When you are next in a Chinese supermarket just ask for Jellyfish. They should come sealed in a plastic container. • Once you have your jellyfish you really do need to rinse the salt off under cold running water. • Cut into 1/4 inch thickness and into long strands. Soak in cold water overnight. The following day- change the water 2-3 times over a 2 hour period to get rid of all the salt. • Rinse the jellyfish again under cold water and squeeze out any excess water. • Follow the TIPs instructions above. • After soaking and removing the salt. Pour kettle boiling water to submerge all the jellyfish strands, cover with a plate or lid and set aside for one minute. • Drain and plunge the strands into ice cold water for 5 minutes to stop the blanching process. Drain well and squeeze out any excess water. Place into a bowl. • Mix the strands with vinegar, sugar, soy sauce, sesame oil, chilli oil and sliced red Thai chilli. Cover and put in the fridge to chill and marinate for 30 minutes or longer.